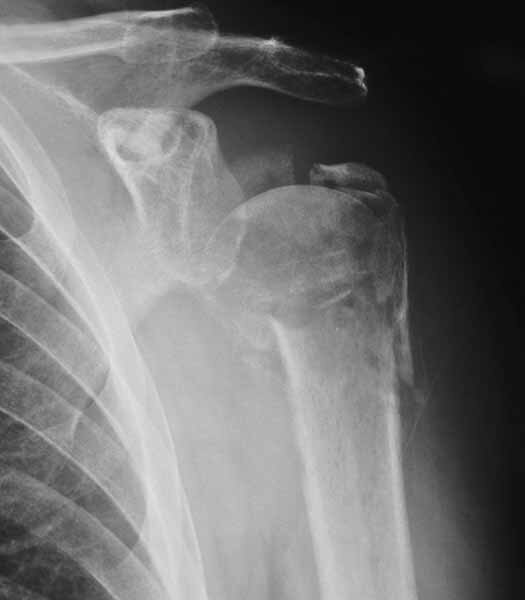 49 yo male RHD architect 3 mos s/p left prox humerus fx/dislocation in MCA presented today wanting know if he had any other treatment options at this time. He had initial PP, which was better reduced, but fell back into valgus impaction. He has 45 degrees FF, 40 degrees Abduction, 20 degrees ER of motion now w/ limited function. Anyone consider ORIF and use Norian as reported for acute valgus impacted fx in Sept JBJS, Hemiarthroplasty or leave it alone? I assume MCA is MVA representing high energy injury. The inferior subluxation appearance on the AP could represent a subtle plexus injury so one should give this some thought. A neuropraxic injury, especially mild can be difficult to diagnose on the first eval and with a fraxture. 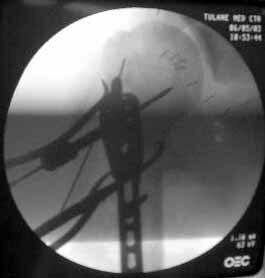 My last humerus shaft fx from a motorcyle accident had a plexus injury that I did not big up the first time around. It appears the fracture has not healed yet on the xray. I would not operate yet at three months. I would wait. I have used OP-1 twice (the Stryker BMP, $5,0000) twice and have found it to work quickly. If surgery opted for, Synthes has a nail with a spiral blade type proximal fixation, I have never use. I think a hemi most likey would be needeed He might be able to live with a nondominate bad shoulder given his job. In Cook county here (with lawyers everywhere) I would move slowly and get to now him. He may do poorly with anything. 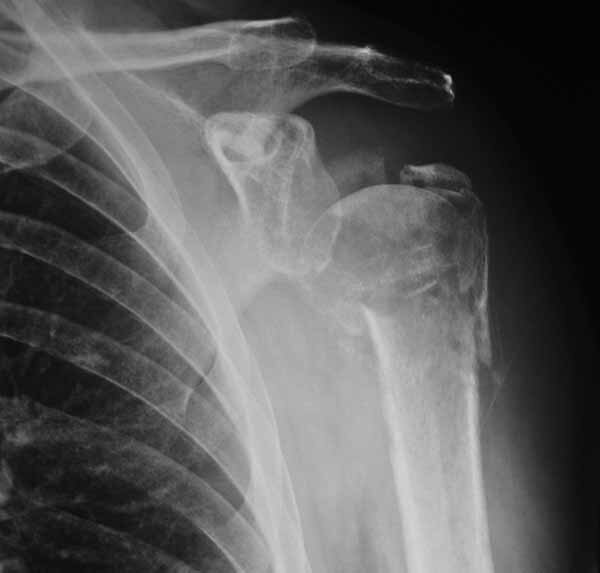 In seven years here I have not had a nonunion or needed to do a hemi for a fracture in a young person. Good luck. Thanks. MCA is mororcycle accident. I am sure he had a slight neurologic injury as he had an inferior dislocation (subluxio erectae) He nicely describes his arm stuck up over his head. He states his axillary sensation is normal now. 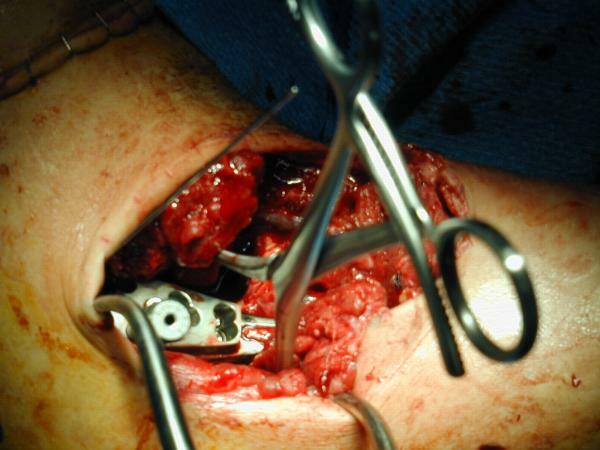 My vote is hemiarthroplasty if it is painful, nothing if it is not. I would not be optimistic about improving motion. 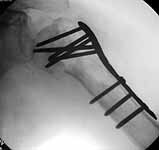 I would consider using the Synthes Proximal Humerus Locking Plate through a deltopectoral incision. After disimpacting the head you should be able to get good stabilization even in this very osteoporotic bone with the combination of converging and diverging holes. I would fill in the resulting defect with your bone volume replacement of choice. 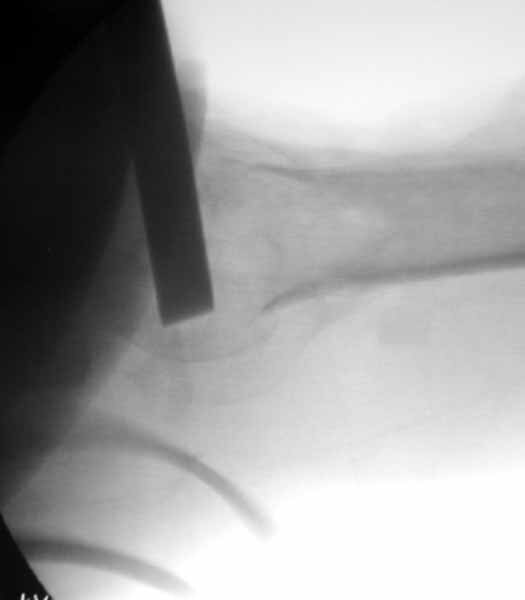 We still tend to favor autologous bone graft but have also used Norian (the semisolid putty rather than the runny liquid) and other bone graft substitutes. I will try to dig up some intraoperative and clinical photos as well as radiographs. The attached photos show a bit of the technique. Thanks for the info. 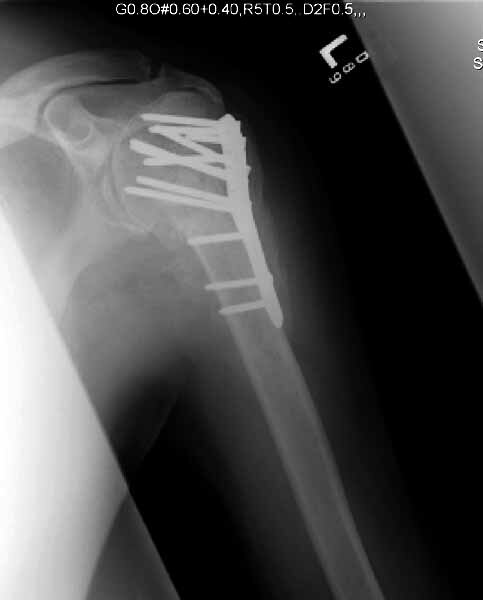 I use the plate frequently, but never in this type of nonunion w/ a thin piece of humeral head. My concern is maintaining fixation in the head w/ the gap that will be present after repositioning. Thanks for the pics. It's hard to tell from the xrays exactly how thin the head fragment is but I wonder if you were able to get screws right up to the subchondral bone, backfilling the impacted area well with bone graft, and be a little more protective, if you wouldn't be able to get it to heal. 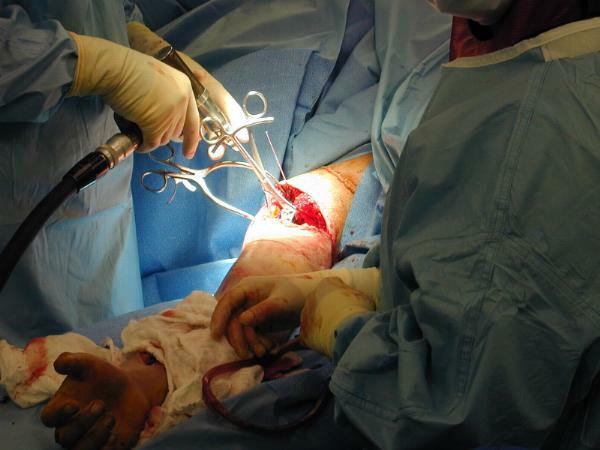 I think that a hemiarthroplasty, while certainly a reasonable choice, burns another bridge. Tough case for sure. I'd replace it at this point. 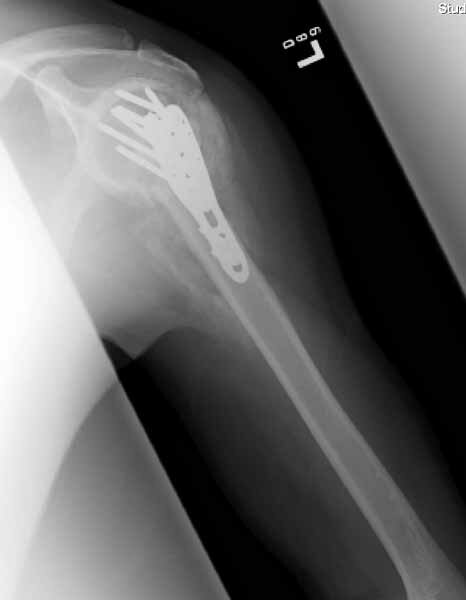 But if you decide to fix it, i'd use the fixed angled locked screw proximal humerus plate because I think it gives opportunity for many fixed angled points of fixation...more than the single blade for the rod. 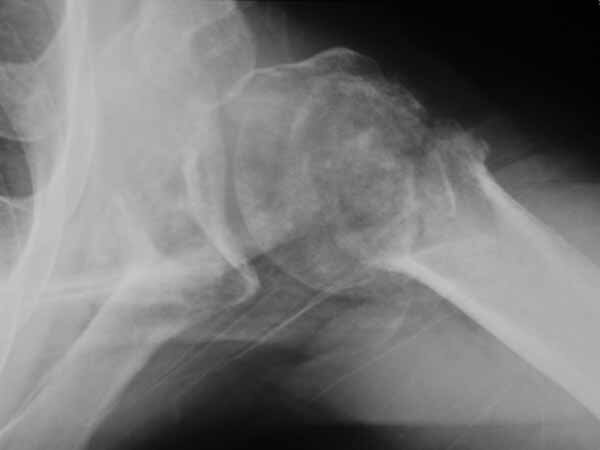 an example attached (although admittedly not for a nonunion). Attached are pics of malunion w/ osteotomy and fixation w/ Norian in gap after improving valgus impaction. 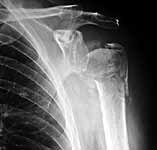 Xrays look better. We will see if he improves as well.